Dhruva Nakshatra is the name of the pole star in Hindu Religion. The origin of Dhruv star is narrated through an interesting story in the Bhagavata Purana. Dhruv was the son of King Uttanapada and Suneeti. The king also had another wife named Suruchi and she had a son named Utham. The King had a special attachment for Suruchi and the queen decided to take advantage of this to make Utham, her son, the next king. But the next in line to the throne was Dhruv. Once the young Dhruv saw his younger brother Utham sitting on the lap of his father, now he also wanted to sit on the lap of his father. But when he ran to his father, Suruchi rebuked him and asked him to go to God and ask him to let you sit on his lap. The king felt sad but remained quiet for not wanting to hurt Suruchi. Dhruv was a determined child and he immediately went in search of God. He walked away from the palace and passed through numerous places but no one could guide him to God. Finally, he met Saint Narada in a forest. Saint Narada tried all means to send him back to the palace saying he was too young to meet God. But Dhruv stood his ground and said he will only go back after meeting god. Impressed by the young Dhruv’s resolve, Narada asked him to sit on the banks of Yamuna and meditate by chanting Om Namo Bhagavate Vasudevaya. Dhruv did exactly as told by Sage Narada. Gradually, the meditation became so intense that the young boy gave up food and water. 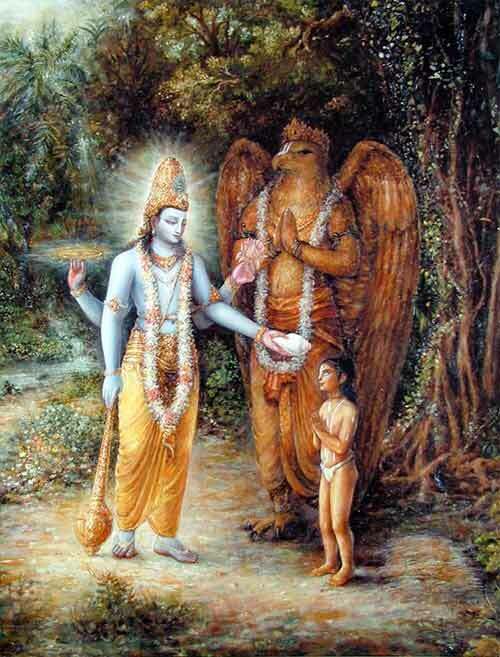 Impressed by his determination and courage, Lord Vishnu appeared before him and he was overjoyed to see him. Lord Vishnu gave him the boon that he will rule the kingdom for several years and finally he will find a place in the heaven and will get to sit on the lap of God. Dhruv returned to the palace and he became the king in due course of time and ruled the kingdom wisely for many years. After his death he became the Pole Star – sitting on the lap of God.